In 2014, Flint, Michigan was in deep trouble. To save money, the city’s managers decided to shift the water supply from Lake Huron to the Flint River. Soon after, citizens began complaining about the water that flowed from their taps. Dr. Mona Hanna-Attisha, a pediatrician at a local hospital, took state officials at their word and encouraged the parents and children in her care to continue drinking the water – after all, it was American tap water, blessed with the state’s seal of approval. Turns out that the Flint River water was corroding the city’s lead based pipes – pumping lead into the drinking water supply. The state was in denial. But the power brokers knew what the deal was. Dr. Mona’s job was to expose the truth and get help for her patients. 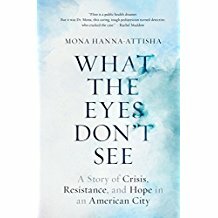 Dr. Hanna-Attisha lays out the details in a new book – What the Eyes Don’t See: A Story of Crisis, Resistance, and Hope in an American City (One World, 2018). In October 2014 – eight months before the first newspaper article was written about lead in Flint’s drinking water – General Motors stopped using the Flint water because it was corroding engine parts. GM knew there was a problem. The Flint water was corroding their engine parts. They switched over to the water that wasn’t corroding their engine parts. Did GM know that the Flint water was corroding the leaded pipes and sending lead into the drinking water? Dr. Mona’s father worked for GM as an engineer and one year was given the Boss Kettering award for innovation. You say in your book, in that year of 2014, when GM said it was corroding engine parts, you were telling patients – it is okay to drink the water. Let’s back up to the water switch, which happened to great fanfare in 2014. Why did Flint switch water supplies? Was that done to save money? Why would they say they would then move back when a new pipeline was built? When you heard about it, what was your thought? Before the water crisis, how were they being exposed to lead? What was in the water of the Flint River that was corroding the lead based pipes? When the water was coming from the Great Lakes, was that being treated so that it wouldn’t corrode the pipes in Flint? The pivotal moment in the book is when you seek the blood tests of the kids in Flint to see what the blood lead levels are. You eventually get the blood tests and go public with the information. And that is what triggered the public response. What was the response when you went public? Was justice done? Is there a movie in the works on this book?